Hacienda Riquelme is part of the Nicklaus Golf Trail, it is a testing 18-hole par 72, course, 6416 m, from the back tees. Spectacular views can be had from all rooms with mountains and fairways 1 and 2, from the bedrooms, and pool, fairways 8 and 9, lake and distant sea views from the lounge/dining.There are 2 sun loungers on the large terrace along with table and 4 chairs for al fresco dining. It is a 2 minute walk to the resort centre, where there is a well stocked supermarket. There are childrens play areas dotted around the resort. There is underground parking serviced by a lift. This resort is ideally situated for golfers and non golfers alike. There are numerous activities, horse riding, mountain climbing and fishing. The Mar Menor is one of the best places in the world for watersports and of course miles of beaches to explore. The waters of the Mar Menor have been renowned for their benefits to health. Full sized bath with shower screen, wc, bidet, heated towel rail, shaver point, towels included. Fully equipped kitchen, fridge/freezer, dish washer, washing machine, oven hob, toaster , kettle etc. Notes on accommodation: Air conditioning in lounge/dining room with ceiling fans in bedrooms. Central heating for the winter months.Secure underground car parking with access to apt by lift. No smoking in the apt. and no pets. Suitable for children. Free wi-fi. Outside: The covered terrace has 2 sun loungers and a dining table and 4 comfortable chairs for al fresco dining.There are also 3 fold up sun chairs which can be taken to the pool. 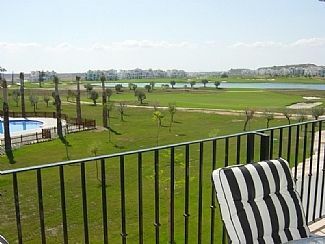 Overlooking the large communal pool, and adjacent to the 8th & 9th fairways with distant views to the Mar Menor. Cleaning / Towels / Linen / Maid service: Towels and linen are provided, please bring your own beach towels. Cleaning is done at the end of your stay unless requested. For stays longer than a week linen can be changed for a small charge. We had a lovely time. The apartment is well equipped and the location is excellent! Thank you for your review. I'm glad you had a good holiday and hope you come back again! The meet and greet was very good and informative. We found the air conditioning wasn’t working, on contacting the key holder, while we were away this was fixed - most appreciated as it was mid 30’s, air con in the bedroom would of been appreciated - although ceiling fans not ideal with high temperatures. The swimming pool was fab! Love that the pools on Hacienda are not too deep so a lovely temperature to cool down. Hacienda is a lovely resort, well maintained and manicured gardens. Thank you for your review and comments. The resort is beautiful, very well maintained and felt very safe. The apartment was just as described, everything you could need and more. A car is a must to see the surrounding area and beaches. Well stocked shop on site and a lovely restaurant. We stayed in October and some facilities were closed however we often had the pool to ourselves! Thank you so much for your review. I'm so glad you had a good holiday and hope you will be back next year. Second floor apartments in my opinion have a definite advantage - better views! I have stayed in three different apartments on the resort since 2014 . This year's apartment was ideal for me as it was really close to supermarket and restaurants. I didn't hire a car this year - which is needed for apartments located further from the shop ( carrying water, etc). I love everything about Hacienda Riquelme and look forward to my next visit! Thank you Pam Coombe for renting me your home. Thank you for your comments which I have noted. The pool chairs have now been replaced and the apt. will have an update this winter. The Mar Menor is a 15/20 minute drive from the resort, where you will find miles of beautiful, safe clean sandy beaches. It's a wonderful place for water sports such as sailing, wind surfing etc. The nearest airport is Murcia , Corvera which is a 25 minute drive from the resort. Alicante is a 45 minute drive. Both are served by many of the low cost airlines throughout the UK. Car hire is recommended. The nearest village of Sucina is less than 5 minutes drive. The historical capital city of Murcia is approx. 25 minutes drive, an exciting and vibrant place to visit. Cartagena, another historical city worth visiting is 30 mins drive. On the resort there is a well stocked supermarket, bars, and restaurant. In nearby Sucina there is a large supermarket along with banks, pharmacy, several restaurants, bakery etc. Dotted around the resort are play areas for young children. Booking Notes: £120 deposit on booking the balance to be paid 8 weeks before arrival. £140 security charge for breakages/damage which will be refunded 2 weeks after holiday. Cleaning costs of €80 euros are paid locally. Airport collection can be arranged. Our representative will meet you at the entrance to complex and show you to your apt. Changeover Day: Changeover day is flexible, to allow you to make use of the low cost airlines. Arrival 3pm Departure 10am but may vary, check when booking. Notes on prices: Prices are for the property per week in UK Pounds. A min. stay of 3 nights. Long winter lets of 3 months or more only £400 per month. Payment can be made by cheque or bank transfer .